Today: A simple pleasure of spring, meant to be enjoyed alone. We tend to often think and write about cooking as something we do for others, but once in a while, I think it is important to celebrate the solo meal. So for week two of three in the celebration of asparagus, I bring you Spring Salad with Asparagus and Soft-Boiled Eggs, which I fixed myself for lunch on Mother’s Day. I often fail to remember how delicious fresh, raw asparagus, the centerpiece of this dish, can be. 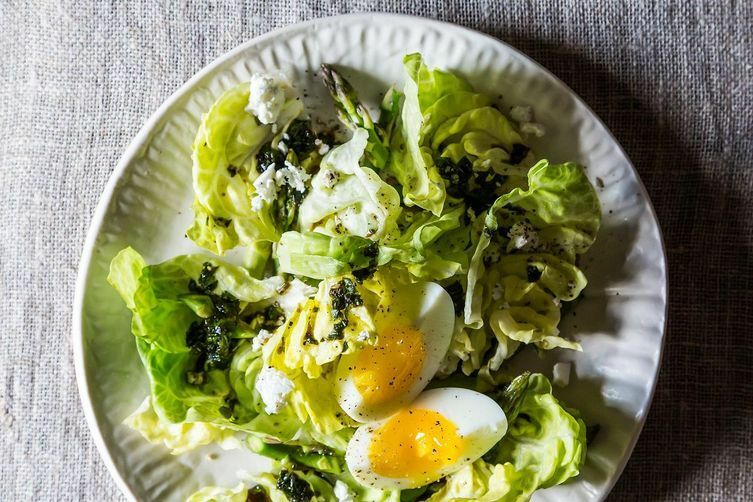 There is little in the way of extra instruction you need here, other than to not overcook your egg (though if it ends up hard boiled it will still be great), to not fret if you have no herbs, and to inform you that really you can use any lettuce you like. The dressing is a nice surprise. More: Want to cook your egg a little longer? You're allowed. Here's how. I did not have any feta but discovered a lovely Tomme in the top drawer of my fridge that I had forgotten about, which was akin to finding a pair of unworn Jimmy Choos in the closet. As I prepped this salad, I stood in my dirty running clothes in the kitchen, playing the Dixie Chicks as loud as my iPod dock would go, using a wooden spoon as my “microphone.” Some pleasures really are meant to be enjoyed alone. It made a great late supper this evening. Yum! I could do that and may...even on a limited budget I try to eat healthily and salad are not the cheapest items to buy in the supermarket here in the UK. I have the usual eggs, lettuce, tomato, spring onions, cucumber, sometimes potatoes/chips, sometimes ham or salmon etc.. so to have alternatives to choose from is great. It helps to have someone suggest a change...thanks. I hope you have nice asparagus there! This is gorgeousness...simplified. Question...Did you use white balsamic or the darker variant for this exquisite salad?! Here in France, a good Tomme fromage is quite easy to find...do you prefer the softer or more aged ones here?..This screams SPRING to me and I cannot wait to get my Dixie Chicks on and mimick your performance as well as this deliciousness-evoking recipe! Thank you for your generous share! I used dark balsamic but I think you could use either. Enjoy your tomme! Happy Mother's Day from Jenny to Jenny...nice! This looks so great I am going to try it.Thanks!! Mmmmm. We've been getting some great asparagus the last couple of weeks at the farm stands - wonderful! Yum! Sounds like lunch today. So it was lunch today-- oddly enough I had all the ingredients -- and it was delicious! Added a few slivers of spring onion. Only thing missing was a glass of rose. You should correct that :) Glad you enjoyed it.